All one-week sessions are for continuing medical education, only, or may be attended as an introduction to the specialty. Although scan labs are or may be included, no one should expect proficiency in the specialty at the end of the one-week session. In most cases, only normal anatomy is emphasized for recognition and scanning purposes. These courses are ideal for sonographers who lack formal training or healthcare providers requiring continuing medical education credits. The focus will be on normal anatomy for the beginner. Individuals attending for Registry preparation will be offered an opportunity to watch more advanced lectures which have been archived and offered mock exams covering all aspects of the specialty. One-week courses are offered in Physics/Instrumentation, Vascular, Abdominal, and OB/GYN sonography. Depending upon your specific needs, you may choose didactics, only, or include “hands-on” scanning with your chosen specialty. The didactic portion can be delivered by distance learning or as a resident student. Upon completion, a CME certificate will be awarded. Abdomen week directly emphasizes normal sonographic appearances, clinical correlations, and a working knowledge of the structures of the abdomen. During this week we go into more in-depth abdominal scanning during our one-on-one scan labs. Each scanning session is tailored to the need of each individual student to meet their specific requirements. Students are able to better understand and apply what they have learned didactically. 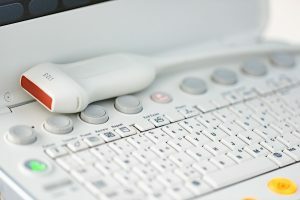 During this week we provide a great foundation and operational knowledge of medical ultrasound. 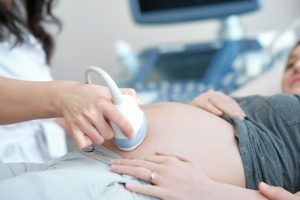 We present and emphasize the importance of understanding the physical principals and instrumentation of sonography and relate it to issues in the clinical setting of today. We also provide you with an introduction to abdominal vasculature, landmarks, and techniques in abdominal scanning which is applied during instructor-led scan labs. During the third week, the normal female pelvis is covered. Transvaginal scanning technique and assessment of the female pelvis. During this week each scan lab will be limited to transabdominal scanning techniques of the female pelvis. 2nd and 3rd trimester one hour dedicated scanning sessions are available upon request for an additional fee. If you are interested in learning more about our one-week course offerings, please fill out our contact form.